How heavily in debt US college students are likely to be by the time they graduate depends on which college they studied at and where it is, says a new report issued by the Institute for College Access & Success (TICAS). The report – “Student Debt and the Class of 2013” – informs that 69% of graduate seniors at public and private non-profit colleges had accumulated student debts in 2013. US graduates in 2013 had an average debt of $28,400, which was a two percent increase on the previous year. However, rates of debt and how much they increased by varied enormously. At almost one in every five colleges, average debt levels jumped by at least 10%. Get college essays for sale with ideas on OnlineCollegeEssay.com. In both 2012 and 2013, approximately one fifth of new graduates’ debts consisted of private loans, which tend to be much more expensive and offer fewer consumer protections compared to federal student loans. The authors gathered and analyzed data which had been voluntarily offered by colleges across the United States. Given that most for-profit colleges refuse to disclose their graduates’ levels of debt, the report relates only to people who graduated from public and non-profit colleges. Newly-qualified college graduates found it much harder in 2013 to find employment compared to their counterparts before the financial crisis hit and Great Recession that followed. In 2013, the unemployment rate for recent graduates was 7.8%, which was considerably lower than 16.5% for those who only completed high school. 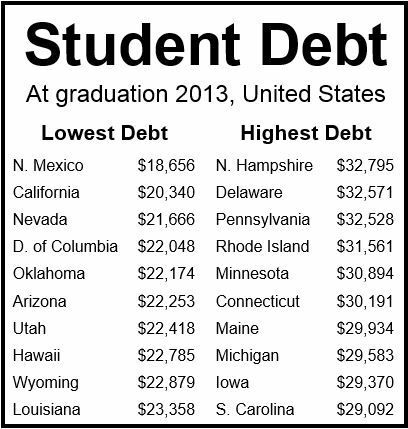 At state level, students’ average debt on the day they graduated ranged from as high as $32,795 to $18,656. Only one state, New Mexico, reported average debt levels below $20,000, while six topped $30,000. The Midwest and Northeast had nearly all the highest debt levels, while the South and West had the lowest. The authors said they found an even wider divergence in student debt levels when comparing colleges rather than states. Average debt levels in 2013 ranged from $71,000 to under $2,500. The chances of graduating with a student debt varied from 100% to 10%, depending on which college a student attended.